Parineeti Chopra, Sanjay Dutt, Ammy Virk, Sonakshi Sinha and Rana Daggubati. Magnum opus Bhuj: The Pride of India is all set to go several notches higher with its new magnificent ensemble cast, reports Mid-day. With Ajay Devgn already leading this project as the makers bring this crucial real-life incident from the history books to the big screen, there are some more credible names adding to the thrill of the film. 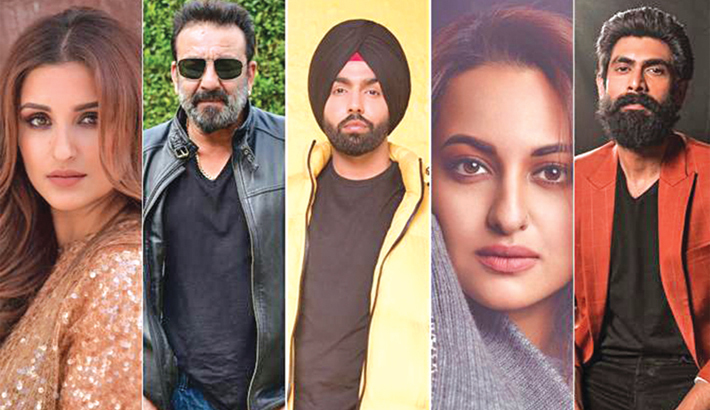 Sanjay Dutt’s commanding presence, Sonakshi Sinha’s alluring strength, Rana Daggubati’s versatility and Parineeti Chopra’s vivacity along with Punjabi superstar Ammy Virk’s power-packed performance, make sure that Bhuj: The Pride of India will be a visual treat for the audience. South superstar, Rana Daggubati plays the role of Madras regiment Lt Colonel who was posted in Vighakot chowki and fought the Indo-Pak 1971 war. The role of the femme-fatale stunner of Heena Rehman, an Indian spy staying in Lahore will be played by the beauty with substance, Parineeti Chopra. Ammy Virk, after establishing his stardom in Punjabi cinema, will become a part of the Hindi film industry with the role of a fighter pilot who played a very crucial role in this historic win. Written - directed by Abhishek Dudhaiya, the film will be produced by Bhushan Kumar, Krishan Kumar, Ginny Khanuja, Vajir Singh, Abhishek Dudhaiya and Kumar Mangat Pathak.